Read the Introduction to Embodied Conflict. Within our skulls lives a fleshy organ of almost unimaginable complexity with functional dynamics that range from macro-level morphology to micro-level chemical and electrical activity at the cellular level. 1 Gerald Edelman (2004) points out that if you started now counting the synapses (the structures that allow electrochemical signals to pass from one neuron to another and that are involved in establishing networks or webs of neuronal structures) in the brain at a rate of one per second, it would take you 32 million years to count them all (p. 16).2 Beyond what we are learning about brain function (for example, the sheer number of synapses,3 the delicate balance of membrane properties that give neurons their subtle electrical charge, the cellular-level action of neurotransmitters, the molecular binding of neurotransmitters to post-synaptic receptors, the distributed and interconnected activity among different brain regions with different neurotransmitters and chemicals whose properties change the timing, amplitude, and sequences of neuronal firing, the reciprocal connections between different brain structures that provide what are called reentrant processes that seem to be key to consciousness and self-awareness (Edelman, 1992; Edelman and Tononi, 2000; Edelman, 2006; Tucker, 2007; Tuckerand Luu, 2012; Fuster, 2013)), there remains so much that we don’t know, and very much more than we do know. What we do know remains disjointed and not unified, parts of a puzzle not all of which yet fit together. The vocabulary of neural structures, networks, matrices, circuits, etc. is to some degree only metaphorically representative of an organic reality that is much more complex and dynamic than we can easily visualize. The brain is in a constant hum of activity with millions of synapses firing simultaneously in a vast array of inter-related and overlapping patterns beyond our capacity to map at this point. Neuroscience is in its relative infancy or perhaps its early adolescence, active, adventurous, and full of new discoveries and understandings. There are competing theories of how learning and memory work (for a review, see LeDoux, 2003), different frames of focus and emphasis (e.g. Dehaene, 2001), and, as is true of all scientific frontiers, cumulative research is exploring dead ends and making course corrections as it constructs a reliable map of this new territory. Our tools, though increasingly powerful and able to provide access to finer detail, remain relatively blunt. Researchers are eager for the next generation of technology.4 Moreover, different researchers work on different areas of the territory, from different perspectives, with different guiding premises and areas of focus,5 make different interpretations of the evidence we have been able to decipher thus far, using different metaphors and terminology to describe brain function, the nature of consciousness, the self, and the interrelationship between conscious and unconscious activity. Somewhere in the neighborhood of 30,000 brain researchers gather each year for the Society of Neuroscience conference. As the accumulative research project progresses, there is some disagreement among the attendees about how the brain works and what is suggested about who and how we are. We are too early in our exploration for there to be a grand, universally agreed upon, coherent theory of brain function universally agreed to. We are like the proverbial blind men describing the elephant. The brain is a very complex elephant. Read the entire Chapter II. by clicking HERE. 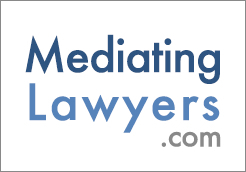 "One of, if not the best, sites on the subject of Mediation I have had the opportunity to visit. I am interested in becoming a mediator and this site is encouraging and educational."